This work is based on synergetically exploiting the activity of graphene-based materials and trityl free radicals to sense xanthine (X) by their combined scavenging properties for superoxide anion radical (O2•−). For this, reduced graphene oxide (rGO) and rGO covalently functionalized with a perchlorotriphenylmethyl (PTM) radical derivative (rGO@PTM) are synthesized, characterized, and casted on an electrode surface to achieve a highly sensitive electrochemical recognition platform for xanthine determination. 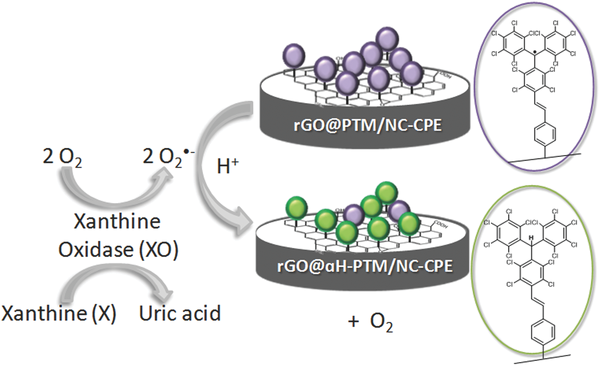 The electrochemical analysis is based on impedimetrically monitoring a radical-involved reaction on the graphene-based electrode surface after reacting with such O2•−derived from the xanthine/xanthine oxidase enzymatic system. The presented strategy yields to determine X at nm levels, decreasing the detection limit 100 times with respect to previously reported (bio)sensors. Congratulations to Dr. Francesc Bejarano, new ICMAB graduate!